Terminal, which has several tabs: Trade, Exposure, Account History, News, Alerts, Mailbox, Market, Code Base, Experts, Journal. Traders can click each one of them in order to become familiar with the particular type of information they contain. The “Trade” tab, for example, is the place where open orders and trades can be viewed, including the symbol, trade entry price, stop loss levels, take profit levels, closing price and profit or loss. The “Account History” tab, on the other hand, lists all of the activity that has occurred, including closed orders, over a selected time period. Charts come in three different flavours: line, bars or candlesticks. They are highly customizable – from the colours for each variable, like background, foreground, grid and bars to zoom in/out feature and multiple periodicity options (starting with the 1minute timeframe and going up to the monthly one). Furthermore, a variety of technical analysis indicators can be added to any price chart. Expert Advisors (EAs) which can be used to implement strategies and automate trading. 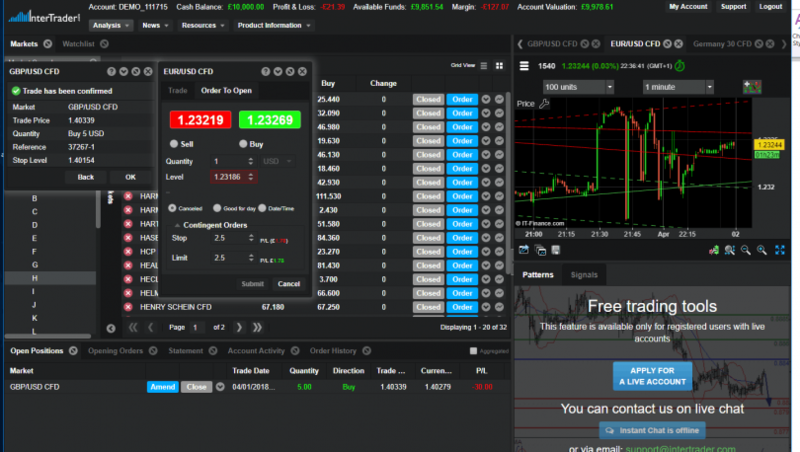 They are very popular particularly with traders that have programming skills. The fact that by now hundreds of brokerage companies have chosen Metatrader 4 is the best testimony that it delivers outstanding value and meets both their and traders’ expectations. With all the above in mind, it’s easy to understand why InterTrader decided to concentrate on MT4 as part of its rebranding efforts. InterTrader, part of the GVC Holdings PLC, listed on the London Stock Exchange (LON:GVC), decided to target the retail market not only in the UK, but also internationally, as evidenced by the multilingual versions of the website: Polish, Spanish and French, at the time of this writing. As far as I can tell, the choice of trading instruments available through InterTrader is quite impressive: 13 major and 48 minor FX pairs, 14 leading global indices and 15 commodities (ranging from gold to cocoa and sugar). The advertised spreads for each category of products are also very competitive, for example 0.6 pips on EUR/USD, 0.8 pips on GBP/USD or 3 pips on GBP/JPY while some indices like UK 100 or DAX30 come with spreads of under 1 point – 0.9 to be more precise. If we add to this the fact that InterTrader holds client funds in segregated Tier 1 bank accounts and is operated by GVC Holdings PLC – multinational group with a market capitalization approached 2 Billion (LON: GVC), I believe the company has the potential to become a major player in the online trading sector.